Be the first to share your favorite memory, photo or story of Beatrice "Betty". This memorial page is dedicated for family, friends and future generations to celebrate the life of their loved one. 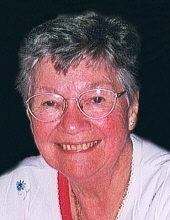 Beatrice “Betty” (Kane) Decker, 91, of Liverpool, passed away Saturday, January 26, 2019 at The Centers at St. Camillus. Born October 3, 1927 in New York City, she lived most of her life in the Syracuse area. After high school, she began working at the NY Telephone Co. For many years, Betty was employed at Dave Ball Chevrolet in Liverpool and a fixture in her son’s restaurants. She was a lifelong Yankees fan and loved the theatre. Betty was a vivacious woman who traveled the world and enjoyed life to its fullest. She was always eager to share a quip or story that brought smiles to those she encountered. Betty was predeceased by her husband, Jack. Surviving are her children, Dana (Constance), Kevin (Ellen), Jacquelyn, Gary (Bernadette) and Brian (Deborah); and grandchildren, Kevin, Jackie and Alexandra. There will be no services. Burial will be in White Chapel Memory Gardens, DeWitt. To send flowers or a remembrance gift to the family of Beatrice "Betty" (Kane) Decker, please visit our Tribute Store. "Email Address" would like to share the life celebration of Beatrice "Betty" (Kane) Decker. Click on the "link" to go to share a favorite memory or leave a condolence message for the family.